New year, new series here on Love+Cupcakes! It’s about time, don’t you think? 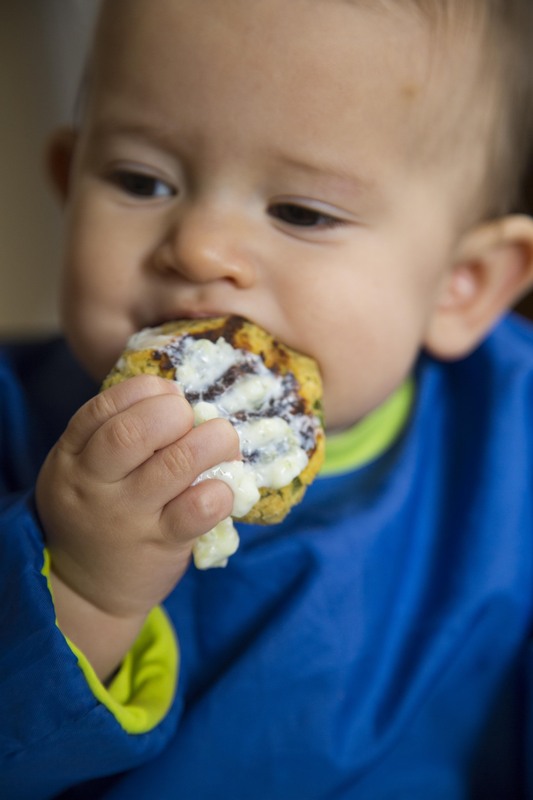 In the spirit of fresh starts, I’m happy to introduce a new column: Baby Bites– baby friendly recipes that are healthy, delicious and made for little hands to pick up all on their own. First up, Chickpea Falafel with Tzatziki. 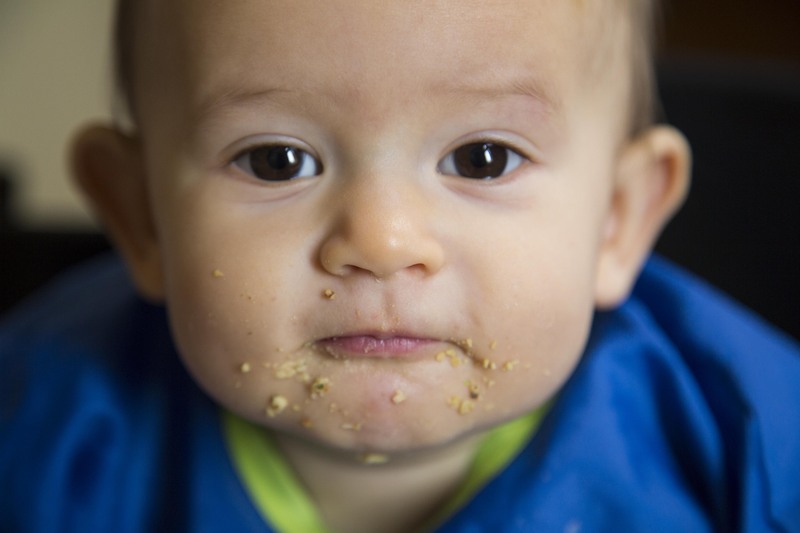 ***A quick disclaimer about using my baby food recipes: This may go without saying but as author of this blog, I feel a sense of responsibility to my readers regarding the content that you find here. I would like to note that I am a new mom and by no means an expert on child rearing in any way, shape or form. Furthermore, I am not a nutritionist nor a pediatrician so please do your due diligence before feeding your infant anything. It’s important to make sure that she is ready, that your pediatrician has given the green light and that you’re introducing foods that are safe and age appropriate. The recipes that I am sharing here are foods that I have given to my own daughter. Okay, enough serious stuff….go check it out! Cielo has been eating solids for a little over three months now and it is the most fun I’ve had with her so far. The girl loves to eat which makes feeding her really enjoyable. I want to help her build a good relationship with food so I try to keep her meals varied and interesting. It’s also important to me that she eat plenty of wholesome foods so I do my best to give her healthy options. Cielo was reaching for food and bringing it to her mouth all on her own, so we decided to practice Baby Led Weaning from the start. These chickpea patties are easy for her to pick up and soft enough for her to chew with her just barely-there teeth, plus she basically devours them so I take it they’re good– at least by baby standards. A little background on Cielo’s eating habits thus far: From about the age of 4 months, we noticed that Cielo was very interested in the foods that we were eating and would reach out to grab for things. We wanted to wait as long as possible to introduce solids to her so over the next two months we offered her very tiny tastes (licks essentially) of simple foods– apple, pear, cucumber, and some others. That seemed to satisfy her curiosity for a while. 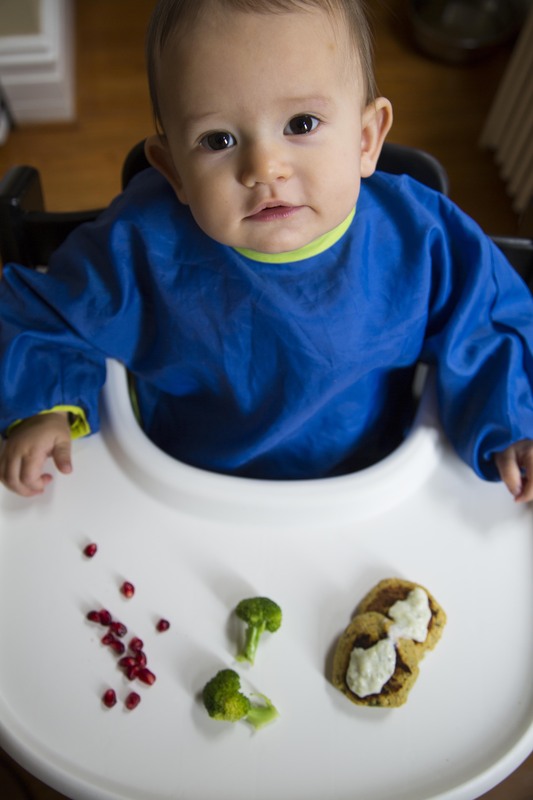 When she was just about 6 months, she tried her first real solid food: avocado. She loved it and naturally took to feeding herself. We continued to introduce new fresh foods– steamed whole carrots, broccoli, roasted beets and sweet potato, etc. It was kind of amazing to see her bringing food to her mouth, chewing and swallowing all on her own. Gagging was definitely part of the process and often it was a bit scary but she always figured out how to swallow or spit out whatever it was. We also gave Cielo homemade puree’s in the first month to supplement her meals since really only bits were being consumed when she fed herself. But very quickly, she caught on and by 7 months, her meals consisted of all finger foods (with the exception of yogurt, applesauce and the like). Cielo hasn’t gotten the hang of dipping quite yet so I like to put a little of the yogurt right on her falafel. Falafel in general tends to be a bit dry so the yogurt helps a lot. Generally, Cielo will eat 1-2 of these patties along with a few veggies and fruit on the side. Often I make the falafel ahead of time and freeze it. When it’s meal time, I’ll quickly throw together a sloppy version of the tzatziki so she has fresh yogurt every time. 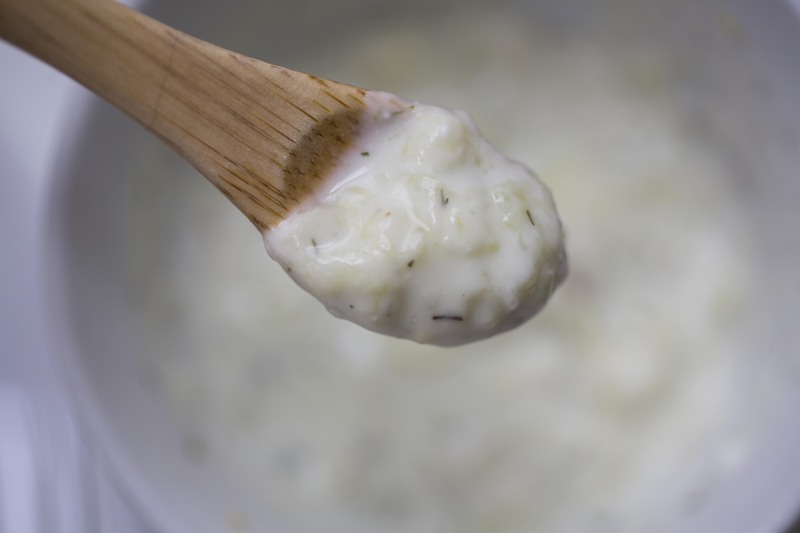 Combine yogurt, dill and grated cucumber in a small bowl and set aside. Heat olive oil on medium in a small frying pan and sauté the onion and garlic until soft, about 8 minutes. Let cool and transfer to the bowl of a food processor, and add in drained chickpeas, parsley, lemon juice, cumin, smoked paprika, eggs and cereal (if using). Pulse 3-5 times or just until all ingredients are incorporated. You want a little bit of texture in the mixture, not a paste so don’t over process. Add olive oil as needed to make the mixture come together (a light drizzle will probably suffice). Use a tablespoon to scoop out even amounts of the mixture and form patties with your hands. Place patties on a baking sheet and bake for 20 minutes, flipping halfway. (Note: this step is important in ensuring even cooking). 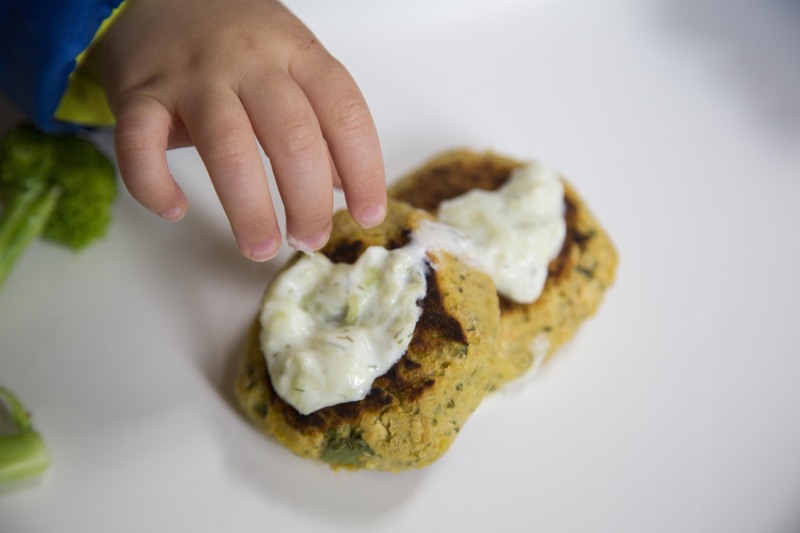 Serve falafel warm with yogurt for dipping. 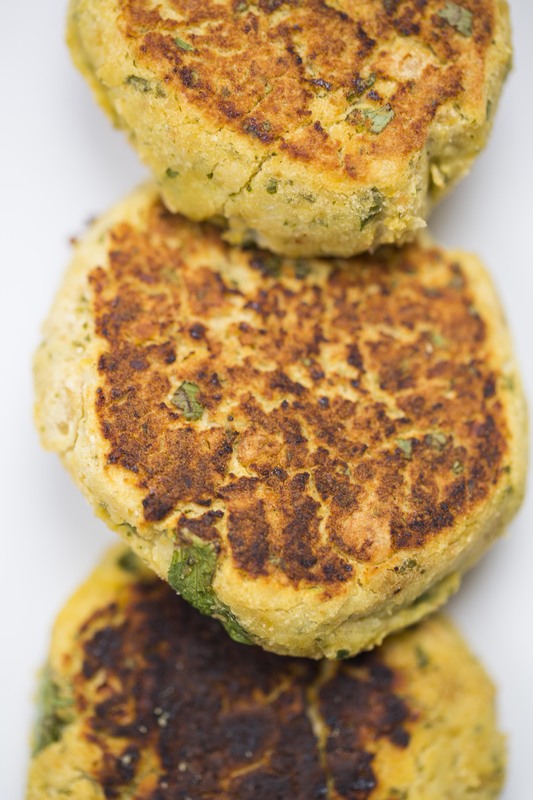 Freeze or refrigerate any leftover falafel for later use. The tzatziki will keep for about 3 days in the fridge. Those look delicious – they have such a nice colour. And it looks as though someone enjoyed them! I have to try your recipe! Hahah! No! I would totally eat these. yum! this sounds so good. I’ll eat chickpeas in just about anything. Thank you, this looks and sounds like a delicious recipe! I love chickpeas and look forward to making a batch and freezing for quick snacks and lunches! Looks delicious and the pictures are adorable! I got so hungry looking at these photos, I’ve had to go off & make dinner! super excited for the new recipe series! I’m always looking for new things to feed my little ones! These look great. Glad I found your site. Can’t wait to try them! heej, it looks delicious. Do you want to follow us? we also follow you. These look great! My two year old daughter would love them. Can I use 2 T of breadcrumbs or panko in place of the cereal? Okay, this one is going on my to make list! Looks fab and something that can be eaten anytime of the day! Thank you for sharing!!!!! Looks amazing! I am going to have to try your falafel recipe. I use a Canon 5D Mark III with a few different lenses. Love the pictures of your little guy. Looks like he is loving that falafel, nice tame tzatziki for kids. Your recipe looks delightful. I will be sure to make them soon. Pictures are precious memories!